I put off last Friday’s post because a last minute opportunity to go to Anchorage came up. It had been almost two years since I had been and it was good to be with family and friends again. The week before I mentioned that if you wanted to find Sasquatch tracks, a good place to begin would be where tracks had been discovered before. 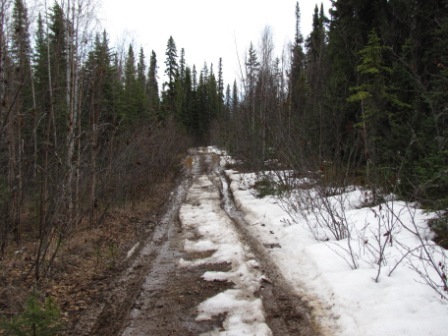 Well, last week I was scouting a local road where tracks have been located before. I was checking the remaining snow in the shaded areas for sign. There was plenty of mud on the road and it was a bit of a challenge even in 4 wheel drive. I spun out and thought it wiser to not proceed. Still plenty of snow and lots of Mud! I stopped the JEEP and walked ahead 30 or 40 steps in attempt to determine if proceeding on foot would be worthwhile when I heard a distinct “WHOOP” sound. My oldest son heard it too. I responded with a “WHOOP” and during the next five minutes we both heard distant voices. It was as though we were hearing a rumbling, low conversation that mimicked our own conversation. The voices eventually stopped and there were no responses to my additional “WHOOP” calling. The perspective is a bit misleading. Instead of looking up hill, you are looking into a ravine. Voices were heard in this area. Was this an isolated and unique event? Not really. There is plenty of documentation of this sort of thing occurring. 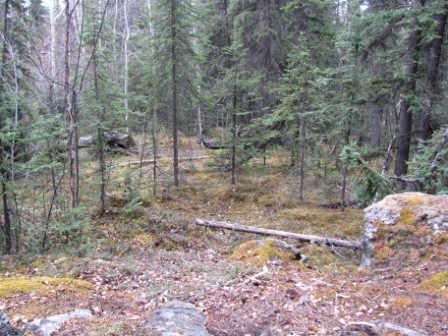 Even the Alaska Files contains reports of hearing voices and laughter in the woods. Due to prior discoveries of tracks in this area and now vocal responses, I have decided this area will be one of the areas where focused research will be conducted this summer. Godspeed loyal readers. This entry was posted in 2015, research area, voices and tagged scouting, vocals, whoop. Bookmark the permalink.